caja needs to be user installed to get Desktop support. The unity launcher doesn’t update to new background color in the session the background is changed in. When any window is open there is a white line down r. side of screen. I guess caja becomes new default file manager for folders on Desktop? Can you open folders with nautilus from Desktop ? Is there any gsettings key (see above )like caja ? If that’s all the patches needed for nemo and if it works better than caja I am all for using nemo for drawing desktop background. And unity greeter desktop bg fix made the repo long time ago. But it requires background plugin enabled. Sure. In the nemo case it doesn’t become default file manger at all unless specifically set by user. So it just takes on handling the ‘unhandled’ Desktop… There are no gsetting keys for Desktop handling nor default file manager. By default nemo-autostart.desktop is installed to /usr/share/applications where it’s of no particular use. For path of least resistance I just symlinked a patched version to /etc/xdg/autostart ( vs. figuring out altering meson install paths. The 2 sec delay is a throwback to 18.04, probably not needed or could be 1 sec. As said I think both caja & nemo should be run thru to see which offers best value and usability. Is there a way to separate Unity launcher and the dash from Unity DE? It’d be nice to install the launcher as the dock and the dash as the menu, without all those dependencies. Few days ago, I had a problem with Unity, showing fonts on the panel in dark grey, but today, after upgrading unity-settings-daemon, unity-control-center and by changing the theme using gsettings in terminal, the settings I had returned, even the hotcorners, which was set with Unity Tweak. But, UTT doesn’t open still. CCSM works. Btw, where is this “hotcorners” stored in the system? UTT is not there, was uninstalled. I noticed that is also the issue in cosmic. Can you confirm? And please open a bug against compiz in disco ? UTT doesn’t open still. CCSM works. Why don’t you open a bug against UTT on github? Caja on the other no such issues, but it requires patches for itself, u-c-c and u-s-d, and even then it has that launcher bg issue (I can reproduce now, do you know what exactly set the launcher bg ?). We have too little time to get those patches in u-c-c for disco. I will open a issue at nemo upstream, let c if they accept few patches. I was just giving info of what works, what doesn’t. UTT is not a Unity DE default app, but a configuration app. It worked before, now its not. But, the settings I put in before using UTT still works, so the question is where that hotcornerssetting is stored in the system. I can’t find it. The thing is UTT was completely purged, when it didn’t work. So, the Unity system must’ve the hotcorners ability somewhere. The can, to a limited extent, be accessed thru dconf-editor. Only plugins that install with key values will be shown. For all others they become available if changed from the default value and if set back to the default will disappear. Does that mean, the default values set with UTT cannot be deleted or changed, as the app is not there any more to change that setting? I am also attaching a patch for light-themes (no bg color for hover), feel free to comment if anything else is missing. UTT needs to be patched. If proposal to use nemo-desktop is accepted we can use replace nautilus gsettings key with nemo and then it will work. For nemo - you don’t actually need any nemo patches. For UB we are delivering nemo action files via our budgie-desktop-environment package - since the existing cinnamon specific actions dont work in budgie - they are never shown in budgie. For the autostart - we are also delivering a specific budgie autostart file into /etc/xdg/autostart - again via the above package. 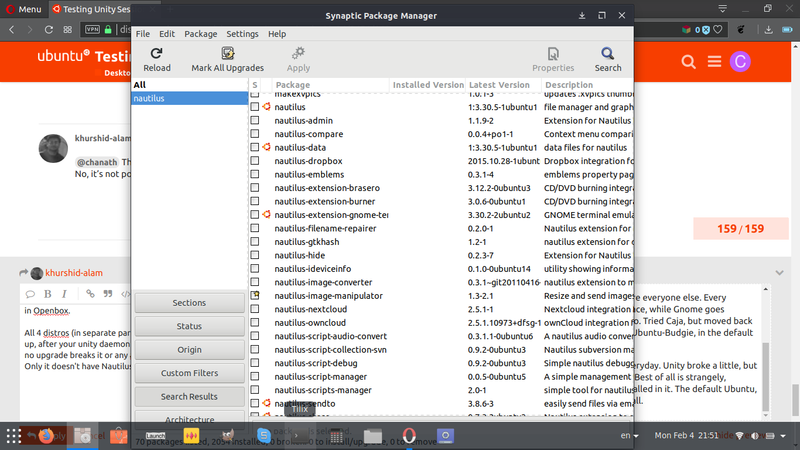 If proposal to use nemo-desktop is accepted we can use replace nautilus gsettings key with nemo and then it will work. Who should accept this? If it means us users, then we do. Please patch the nautilus gsettings key with nemo. The patches I created is for nemo-action. But we don’t really have anything to ship those. But nemo-desktop already has a autostart process. If you don’t set NotShownIn in original wouldn’t both will start ? out of the box - no nemo-desktop is not autostarted - the autostart file is in /usr/share/applications. I expect the mint guys probably just symlink to that. Both Unity and ourselves should not use that autostart - we should have our own with “OnlyShowIn=Budgie/Unity” so that we do not clash with other DE’s that may be installed. Doesn’t Unity have an equivalent overarching customisation package e.g. “Unity Desktop” or something similar? Ah, Right. Thanks for explanation. Unfortunately no. 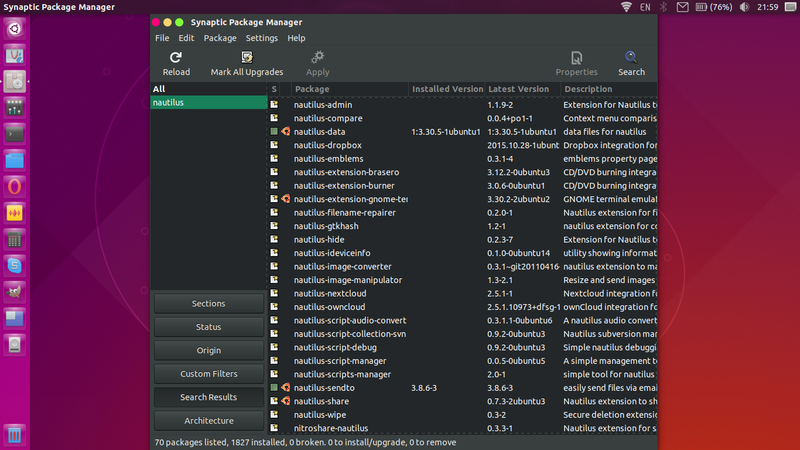 We only have ubuntu-unity-desktop, but that’s just seed meta-package. hmm - that’s a shame. Obviously the Unity team should start thinking in that direction - I am sure you already are!! As Ubuntu itself is moving in a different direction from Unity, there will be more and more stuff Unity will have to “tweak” to keep & enhance the desktop where it diverges from GNOME. Trying to get DE specific patches into something like Nemo will be very difficult / nigh-on-impossible since Nemo was created for Cinnamon and is maintained only for Cinnamon. Meanwhile I will try to do the same in Ubuntu-Settings. Is it possible to separate unity launcher and the dash from Unity? Do you remember unity2d days, in 11.10, and 12.04? They were separate there. Compiz can be the stand alone WM, but needs a launcher and a menu. Have a look at Ubuntu 12.04. It is forgotten, but it gives some thought. @chanath This is the thread for unity session testing. So better ask privately. And to answer you question, No, it’s not possible anymore. This is the thread for unity session testing. I know, for I started it. I’ve been testing Unity session on 19.04, practically before everyone else. Tried Caja, but moved back to Nemo. I run Nemo 4.06 in Ubuntu-Budgie, in the default Ubuntu, in Ubuntu-Unity and in Openbox. All 4 distros in separate partitions are kept updated everyday. Unity broke a little, but picked up, after your unity daemon and settings update. Best of all strangely, is the Openbox install, for no upgrade breaks it or any app installed in it. The default Ubuntu, also keeps up very well. Only it doesn’t have Nautilus at all. I don’t remember today, how I got rid of Nautilus from the default Ubuntu installation, but somehow I did. In the Unity installation, I have got rid of Nautilus too, but can’t get rid of nautilus-data, which is gone from the default Ubuntu installation. If I try to uninstall nautilus-data here, it’d uninstall unity, unity greeter, unity control center, etc. Nautilus can be purged. I somehow did, only can’t remember how today. Most unique situation is with the default Ubuntu, where neither nautilus nor nautilus-data are present, and it is working. So, there maybe a way to separate Unity from its baggage of dependencies, even if the parts of Unity DE cannot be separated.